The Jack-in-the-Box has been one of the most enduring toys throughout the centuries. There are many stories and theories circulating about the origin of this classic toy. One is that it was popularized in the 15th and 16th centuries, based on the very popular “Punch” puppet featured in the “Punch and Judy” shows seen in public squares throughout England beginning in the Middle Ages. 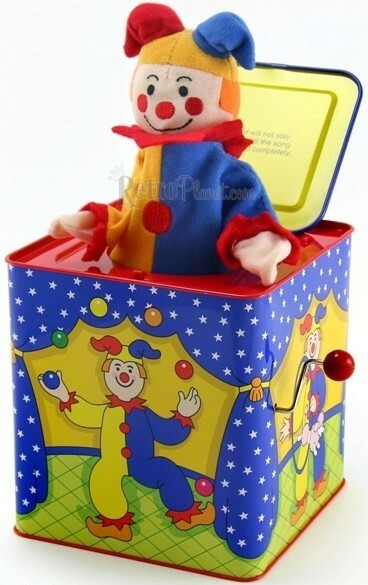 Early Jack-in-the Box toys resembled the jester Punch, with his white painted face. Another theory is that the name “Jack” was a reference to the devil, referred to as a “jack”. There is a legend in England about a medieval ecclesiastic who claimed to have captured the devil by trapping him a boot. This story may have contributed to the toy’s invention as well, as illustrations were made of him holding a boot with the devil’s head popping out of it. Of course, wind-up toys had been evolving since early Grecian days and there was a revival of this earlier technology with clockmakers beginning in the 13th century. The first documentation of a Jack-in-the-Box toy was of one made in Germany in the early 16th century by a clockmaker as a gift for the son of a local prince. The wooden box had a handle on the side that when cranked, would play music until a “jack”, or devil on a spring was suddenly released. Word spread among the nobles, creating demand for the toy. Technology improved, and by the 1700s, the Jack-in-the-Box had become easier to produce, thus becoming a common toy for people of all ages. The Cockney tune known as “Pop Goes the Weasel” became a frequently used melody in the toy. The Jack-in-the-Box itself became a frequently used image in political cartoons, featuring the face of the latest politician to be lambasted. Since the 1930s many variations of the Jack-in-the-Box have been introduced. 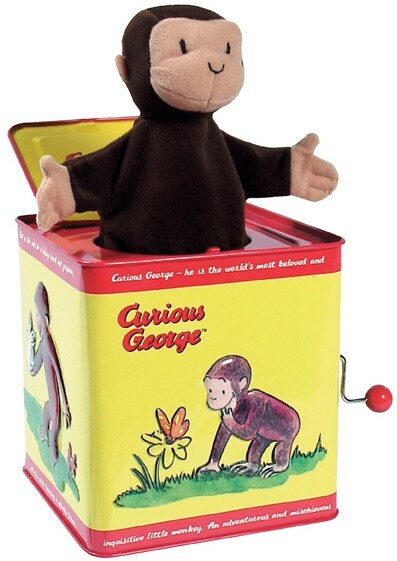 Here, Curious George pops out during “Pop Goes the Weasel”. In the 1930s, the Jack-in-the-Box began to be made out of tin, rather than wood. The exterior of the boxes were stamped with images from nursery rhymes and the “jack” was changed to one of the characters featured in the rhymes. The music was sometimes the tune traditionally sung along to the rhyme. In 1951 restauranteur Robert O. Peterson opened the first Jack in the Box hamburger stand. The top of the building featured a clown head sprouting from a SpeakerBox. In 1980 the company rebranded and the clown’s head became a simple sphere, often sitting atop a human body. The Jack-in-the-Box character continues to be made today and it makes for a great toy for young children, due to the surprise factor associated with it. Of course, many people who are merely young at heart enjoy them, too. Did you have an old tin Jack-in-the-Box when you were a kid? Do you remember waiting – in anticipation – for the “Jack” to pop up?